Have you ever attended The Pampered Chef cooking show/party? Last weekend my daughter hosted such a party, and we all had so much fun. Chef Taryn demonstrated few of her favorite party food recipes, and allowed me to take some pictures, and to post the recipes. If you are familiar with The Pampered Chef, you already know that besides their special cookbooks, they have an interesting selection of kitchen gadgets, utensils, and cookware. Some of the items they sell are really very useful, and a must for every cook/chef in their kitchen. I will write a review about the items I selected, once these are delivered to me, and I get a chance to test them out. Here is one of the recipes from The Pampered Chef party. 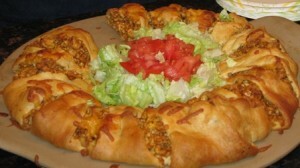 If you are looking for a quick and simple idea for a party food that is filling, appetizing, and great tasting, you will love this Turkey (or Beef) Taco Ring. It looks great, and your guests will think that you slaved over it for hours, but it only takes about 15 minutes to prepare and 25-30 minutes to bake. You can’t beat that! Cook ground turkey in a large skillet over medium heat for 10–12 minutes, or until no longer pink. Stir in Taco Mix, 1 ½ cups of the cheese, and water. Unroll the crescent rolls dough, and separate into 16 triangles. Arrange on a Large Round Stone, and arrange triangles, slightly overlapping, in a circle, with the points or the triangles pointing outwards (looks like a bursting sun). With your hands, press the overlapping ends together, to form a base of the ring. Using a large ice cream scooper, scoop filling evenly over the ring base, in a circle, placing one scoop at the base of each triangle. Bring the points of the triangles up, over the filling, and tuck them under the dough at the base of the ring. Filling will show in between the triangle pieces. Brush the top of the ring with an egg white. Bake 25-30 minutes, or until golden brown. Transfer to a serving platter, fill the middle of the ring with the toppings (lettuce, tomatoes, onions), accompanied by salsa and sour cream. Cut into serving pieces, leaving them in the ring shape. You can also make this recipe with chopped ham and broccoli, instead of the taco turkey mixture. If you do not have the Large Round Pizza Stone, you can use a well greased, round pizza pan. Thank you Meream. It tastes great as well. Besides tasting great, it also looks very presentable. I was impressed. Interesting article, really caught my attention. Good work. I highly recommend this recipe. These Pampered Chef parties are lots of fun, and you get to taste some great snacks. A very good receipt! I cooked your Pampered Chef yesterday, all my family was pleased. Thank you so much for stopping by and sharing your experience.